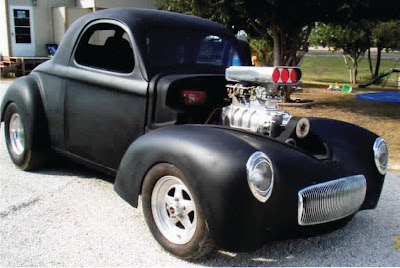 '41 Willys Coupe, 'glass-bodied, 35o Chevy with 350 transmission. 871 blower with dual quads. Dana rearend with 4.10 gears. Front tires are 165-R-15; Rear tires 31 x 18.5 x 15 Mickey Thompsons. Texas Willys ready for new owner. Won't last long at this price.